Recently Fausto Puglisi presented his first menswear show in an abandon train station in Florence coinciding with the debut of his women’s resort collection. The collection was a lesson in excessive Italian fashion and that god-like Italian masculinity. 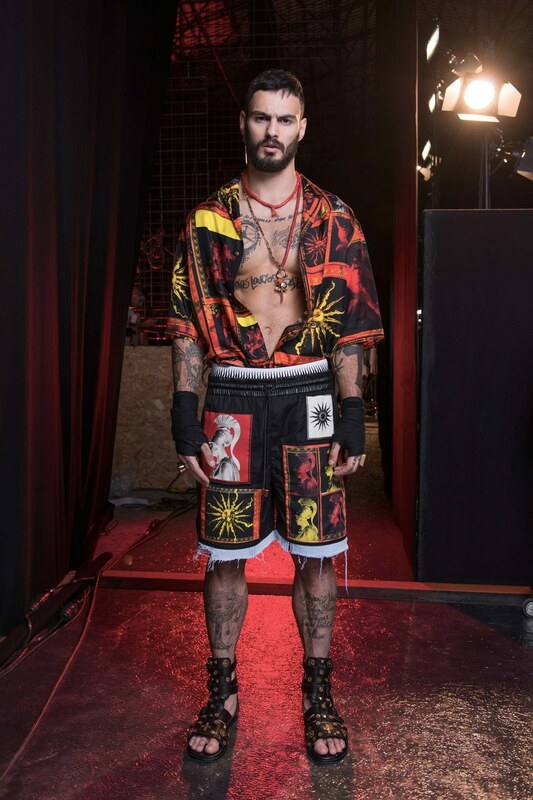 Puglisi opted for less conventional models and chose what looked like tattooed UFC fighters, some complete with ankle tape, purposefully balancing the lavishly ornate clothing with that legendary overt Italian machismo. True to self, Puglisi’s collection was full of Roman iconography from images of Roman warriors scattered in a collage over boxer inspired shorts and bomber jackets, to the heavily embellished gladiator sandals the models donned some knee-high. Namesake tees worn with silk patchwork denim shorts were a favorite, and floral accents slightly lifted the air of the collection paired with embellished black leather shirts and silk bombers. My thoughts are for his first menswear showing Puglisi wanted to come full force thoroughly establishing his voice in the menswear market.